Purchasing a second hand mattress is an affordable way to furnish your home. There are a number of places where you can buy pre-owned mattresses, here are the top 4 options that you should definitely consider. Craigslist is by far the best place to start looking for 2nd hand mattresses. The site has the most number of ads posted by home owners, and you can find at least 6 to 7 new postings (to sell mattresses) everyday. The user interface of the website is very simple, and it makes it very easy for visitors to browse all the available items. 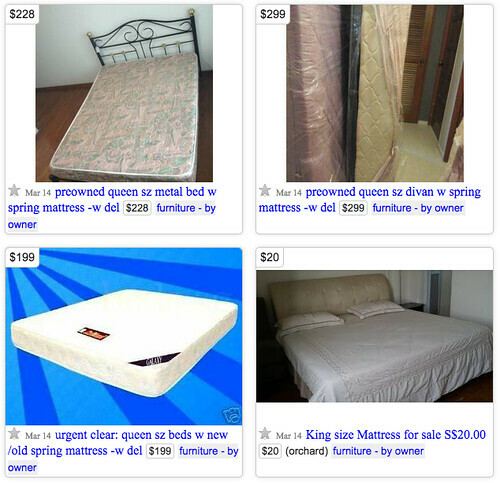 On Craigslist, you’ll find a wide variety of offers, from queen size spring mattresses selling for $100, to king size mattresses selling for $20. If you’re looking to save money on mattresses, you’ll surely find a bargain on the site. Read our review of Craigslist. Gumtree is another popular online classifieds, where you can search for good deals on used mattresses. There are quite a number of new offers being posted daily, on average you can expect over 20 new ads, there’s a substantial amount of people actively selling mattresses on Gumtree, which is great if you’re looking for more choices and the best bargains. Some of the items that you’ll find on Gumtree include queen sized mattresses for $20, and bunk beds with mattresses for $75. In addition to mattresses, you’d also be able to find children playpen (selling for $40), and teak wood bed frames. If you’re not able to find your desired item on Craigslist, you should definitely try Gumtree. Read our review of Gumtree. 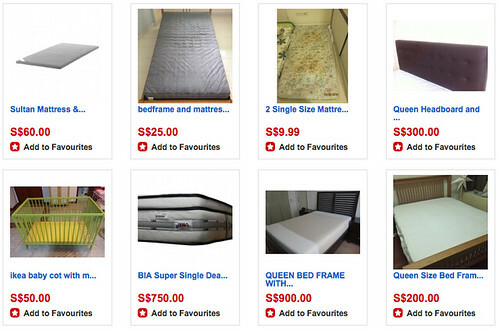 STClassifieds feature a modest number of ad postings for mattresses. The site definitely does not have as many offers compared to Craigslist or Gumtree. If you are looking for mattresses on STClassifieds, you would have a smaller selection of choices. However, there are still good deals to be found on the site, for example, you’d be able to find single size mattresses for $50, and double decker bed with mattresses selling for $100. On average, you’d find about 8 to 10 new postings per day, which makes it a viable place to search for pre-owned mattresses, if you’re not able to find anything on Craigslist or Gumtree. Read our review of STClassifieds. Locanto has a small number of second hand mattress ads, at the time of this article’s publication, the site features only 40 offers in total. 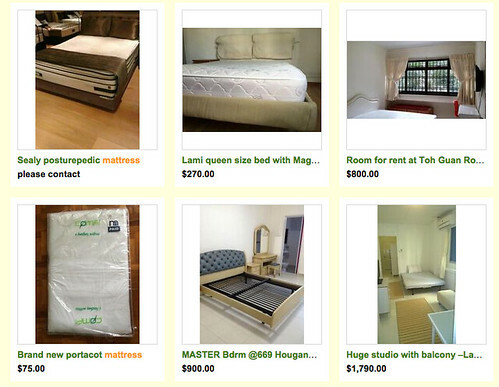 Compared to the previous 3 classifieds, Locanto’s selection is very little. However, that’s not to say that you won’t find some good offers on Locanto, for example you’d be able to purchase queen size mattresses for $70, and single size bed with mattress for $60. You’d also be able to find other related items like baby cot and play mat. Read our review of Locanto. Is Your Used Furniture an Antique?